The first Legoland Park in Asia is getting into the Christmas spirit with another first - Asia's tallest Lego Christmas tree. 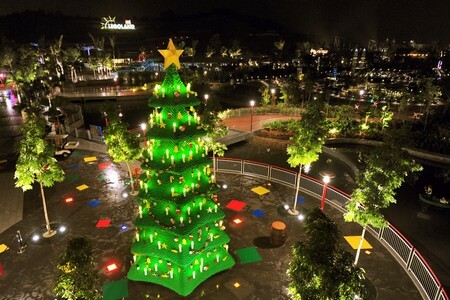 Legoland Malaysia unveiled the nine metre tree at a special lighting ceremony today. Created from more than 400,000 Lego bricks, it is decorated with 260 Lego ornaments. The tree took approximately 10 weeks to build and weighs more than 6,000 kilograms. Designed with an advanced computer programme, it took a team of nine people to complete the assembly. The initial design and building was done in the Czech Republic where the largest Lego Model Shop is located. 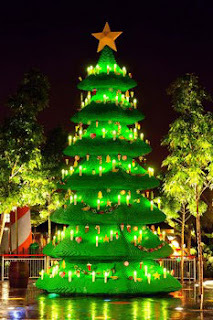 The tree was then shipped to Malaysia in 40 parts and assembled in the park by its Malaysia model builders. The tree has been fitted with 108 special Lego LED candles and is designed to withstand local weather conditions such as heat, wind and rain. Legoland's Christmas tree is a annual tradition at its parks all across the world, said Mr Siegfried Boerst, General Manager of LEGOLAND Malaysia. He lit up the tree for the first time this evening to mark the start of the first year of Christmas celebrations at Legoland Malaysia. 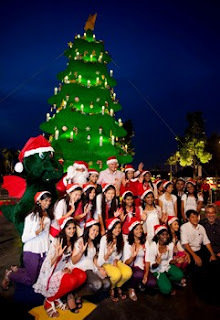 The tree will be displayed at the park from now until early January 2013, and will light up every evening from 7pm onwards. Several activities have been planned as part of Legoland's Christmas celebrations, including special walking characters, storytelling sessions and Christmas ornament building activities. The building sessions will be held at Lego Academy from 11am to 5pm daily, and visitors can choose to either participate in a free building session or purchase specially packed bricks at the Brick Shop. With the purchase, visitors can learn how to build each item with Legoland Malaysia model builders for several hours every day and take home the festive ornaments.